In a continued celebration of my 50th birthday 7-22-15, I’m writing 50 thank you notes in 50 weeks. Here’s number four. The Storehouse Ministry you have established at your church is a blessing to so many. In an effort to thank you for all the ways you have impacted your world, I wrote this story about a day I spent volunteering at Storehouse. The volunteers pour out of the house that used to be the church parsonage. Now, the three-bedroom, brick ranch is home to the Storehouse Ministry: a program that has grown into one of the most productive and efficient food pantries in the region. “I believe we’re ready,” she tells us. 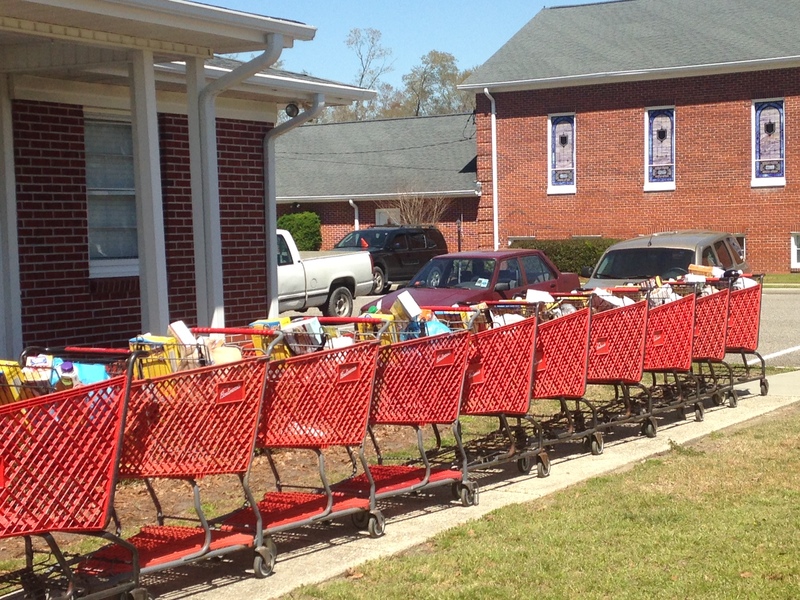 Grocery carts are lined up on the sidewalk; bags of canned goods are piled on the steps. Under the carport around the corner, fresh bread and baked goods are stacked in the bed of a pick-up; frozen foods will be added at the backdoor. The line of recipients has started forming on the other side of the carport; Mrs. Doris’ table is along the back. From there, she and other volunteers will greet each person: checking id’s and credentials while chatting about life this week. Mrs. Doris knows them all. She asks them about the specifics of their lives, remembering them from months, years gone by. She hugs them, she laughs with them, and by her very demeanor she reminds them that they matter, that they are loved. 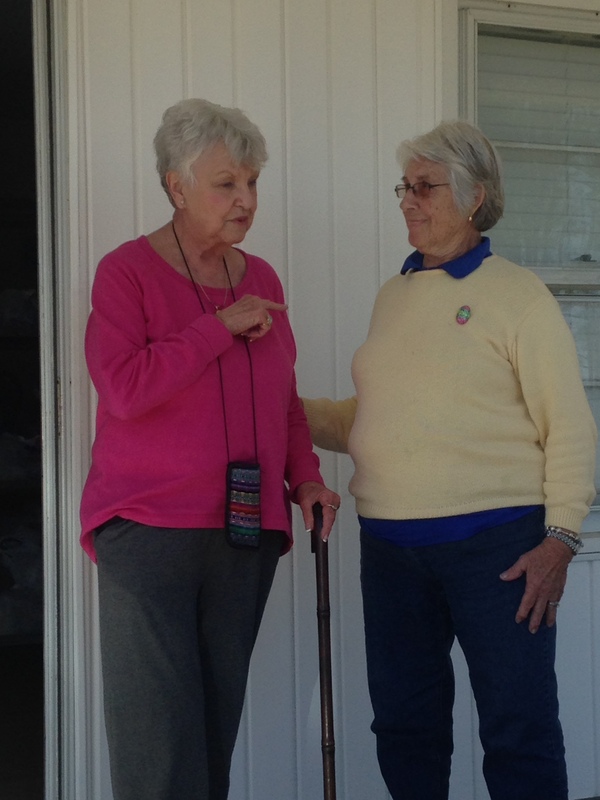 Back on the porch, the volunteers—that day there were more than 20 of us (when she started this ministry, Doris Johnson was one of a two person team)—circle up, squeezing in shoulder to shoulder. They come from her church and other local congregations; but they also come from the community—from Doris’ community. Some worked on the farm she used to have. Some started here as recipients and have stayed on to help. There are wealthy people here, and people who receive public assistance. They are African-American and Caucasian, neighborhood locals and people who haven’t yet learned English. In a few minutes, we would leave that porch and everyone would get busy filling carts and helping recipients load their groceries. Each recipient (unless Ms. Doris knows of special circumstances and makes an exception) will get a single cart that has been filled to beyond the top with canned foods, dry goods, fruits and vegetables, proteins, and treats. See to Doris Johnson, delivering groceries to people in need is important; sharing the love of Jesus, though, is transformative. So every cart that is filled with food is also covered with prayer; every person who comes through the line for service is seen as a beloved child of God. “Let us pray,” I invited the group. And we bowed our heads, committing that day to Kingdom work. Doris Johnson, right, with my mother on the left. Doris Johnson, you are the very face of Christ to so many. Thank you for who you are and for all you do in Jesus’ name. Your example teaches me so much about how to honor God. May the grace and mercy of Jesus Christ be with you always. That’s who I am thankful for today. How about you? Who would you like to thank?